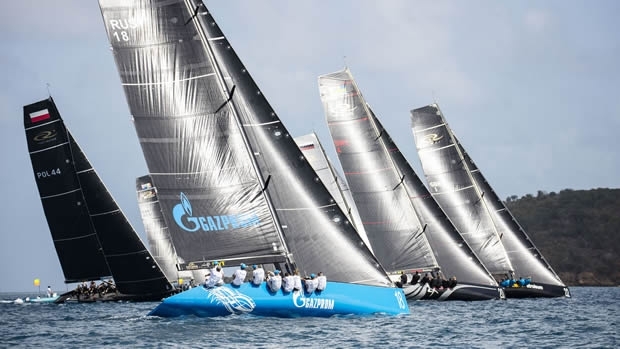 Competition could not have been closer for the opening salvos of the RC44 Virgin Gorda Cup. Following the conclusion of the 2015 Match Racing Championship yesterday, Thanksgiving Day holidaymakers got to witness the first four fleet races, held within the confines of Virgin Gorda's North Sound. The only consistent aspect of the day was the balmy 30°C temperature, with the wind speed having a far greater range than forecast. With two squalls passing through, each bringing winds of up to 20 knots (and some rain) followed by 5 knots or less after. Similarly each race had a different winner with Torbjörn Törnqvist's Artemis Racing coming out on top, with no score lower than fourth in the nine boat fleet, leaving the Swedish team two points ahead of the present fleet racing overall leader, Vladimir Prosikhin's Team Nika. "We are very happy that we stayed in the top half for the whole day," said a relieved Francesco Bruni, tactician on Artemis Racing. "We had a very hard couple of races, when we were leading with a good margin and then lost it…"
The worst case of this was in race two. The blue Swedish boat was ahead at the leeward gate, headed off to the right on a lift and then, as the rest of the fleet went left, never found a favourable shift on which to tack back. Bruni explained: "I didn't want to give up any of our advantage, but it was a mistake, I should have tacked with the fleet. It is a hard balance: To go for the shift or to stay and cover the fleet. I definitely didn't get it right that time." Fortunately Artemis Racing found herself in the exact same position in race three. On this occasion she did tack and went on to claim a comfortable victory. "The guys are giving me enough time to look around, so I can stay 'eyes outside the boat', and that is key in this type of racing. If you are head down, you won't get it right," continued Bruni. Being on the ball was particularly important when the two squalls passed through, the first, in race two, being the more powerful causing the wind to build to more than 20 knots and to shift right hard. It also made the choice of sails tricky with winds at the start of race two demanding the largest headsails, which then proved too large as the squall hit in the latter stages of the beat. Equally the kites the crews hoisted were too small as the breeze subsequently dropped after the squall passed through. For others the conditions weren't an excuse. Igor Lah's Team CEEREF got off to a strong start and won the opening race. But then she trawled the pin mark at the start of race two. "It was a really nice mark, we wanted to have it!" joked Lah. "We started extremely well, but then something didn't work out." While they salvaged a fifth from their mark dragging race, they concluded their day with a last place finish leaving them in fifth overall. Team CEEREF is tied on points with Alexander Novoselov's Katusha, which had similarly mixed fortunes, winning race two but with three other finishes in the bottom half of the fleet. "We were probably top three in every race at some stage," explained tactician Andy Horton. "It is just doing that last bit to get through. In the last race we had a bad leeward mark rounding and went from fifth to seventh. It is really tight, awesome racing and a great place." Owner-driver Alexander Novoselov said he found today's conditions challenging, but is enjoying his first visit to the British Virgin Islands: "A bit up and down today – there were very unstable, shifty conditions, but it is very nice here which is compensation. We're enjoying it very much. We were very proud of ourselves and we did a good job in race two and made almost no mistakes." There was a similar story on Bronenosec Sailing Team where today Vladimir Liubomirov was back on the helm, following his team's RC44 Match Racing Championship victory yesterday. In race two the sky blue RC44 barged in ahead of Team CEEREF at the weather mark, which Liubomirov said was due to a communication problem with his tactician. They were penalised and after carrying out their turn found themselves in last place. Yet they won the fourth and final race of the day. Racing continues tomorrow and with the BVI filling up with Thanksgiving weekend approaching, a course may be set outside of Virgin Gorda's North Sound.